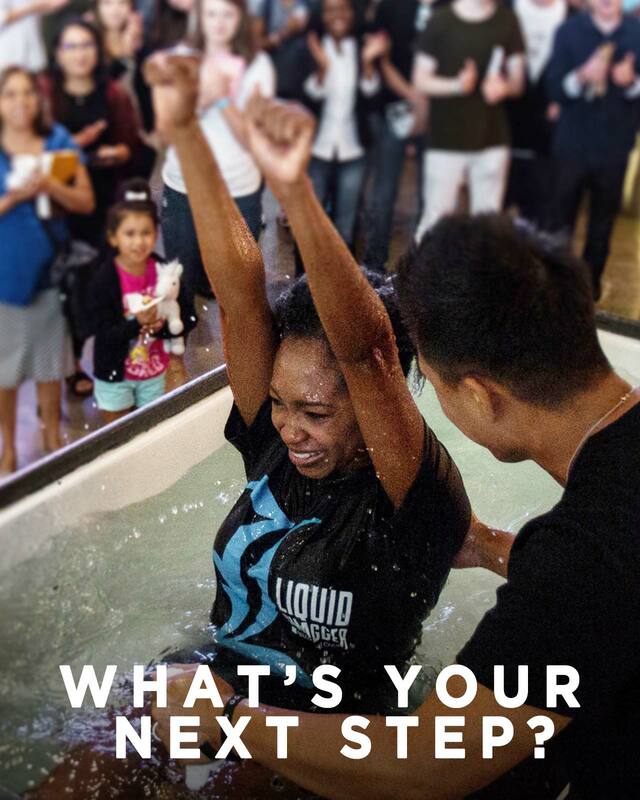 Have you taken the next step by going public with your faith decision through Believer's Baptism? The time is now! This weekend you have the opportunity to join countless others, across all of our FC locations, in taking this exciting next step! For more information call us at 972-471-5700 or stop by the Information Kiosk at your campus. Jesus is our example in every area of life, including believer’s baptism. Jesus had to walk about 60 miles just to be baptized in the Jordan River. To set an example for us, Jesus was baptized – by immersion – to publically identify with God’s kingdom and humanity. Matthew 3:15, “But Jesus said, ‘It must be done, because we must do everything that is right.’ So then John baptized Him." “Baptism” comes from the Greek word baptizo, which means “to immerse.” Like Jesus, we should be baptized by immersion. That means going into the water, being immersed under the water, and coming back out of the water. It’s that simple! Matthew 3:16, 17, “After His baptism, as Jesus came up out of the water, the heavens were opened and He saw the Spirit of God descending like a dove and settling on Him. And a voice from heaven said, ‘This is my beloved Son, and I am fully pleased with Him.’"
What Does Believer’s Baptism Mean? Why is Believer’s Baptism So Important? Believer’s baptism is commanded in Scripture. Also, it identifies Christ-followers with Jesus. What if I’m a Private Person and Feel Embarrassed to Be Biblically Baptized? Going public with our faith by being baptized is the first step of obedience after accepting Jesus as our Savior. It is a public expression of an inward connection. Don’t be ashamed to stand for your Savior! Does the Water Wash Away My Sin? Absolutely not! Only Christ’s sacrifice on the cross and His resurrection cleanses sin. Baptism is a celebration of our acceptance of that fact. Believers baptism is reserved for those who are old enough to make their own faith decision to become a Christ-follower, and it always comes after one’s faith decision. Being biblically baptized, like Jesus was, in many ways confirms the dreams of those who had you baptized as an infant! Am I Really a Follower of Christ If I’m Not Willing to Do the First Thing He Commanded Me to Do? Faith is a verb and demands action. If someone professes to follow Christ, yet stalls at His first command, they need to evaluate the authenticity of their faith. Baptism is an identification event. Going under the water symbolizes the death of Christ. Coming up out of the water represents the resurrection of Christ. When we go under the water, it’s symbolic of the fact that we have died to ourselves and self-centered living. When we come back out of the water we are symbolizing our new life in Christ! We choose to participate in Believer’s baptism after we make a personal decision to receive Christ. As soon as possible after choosing to become a follower of Jesus. Why not today? What Should I Wear When I'm Baptized? We are happy to provide you with a dark shirt and shorts. But, women may choose to bring their own dark shorts and top to be worn over a swimsuit. Men may choose to wear a t-shirt and shorts or swimsuit. You may bring a change of clothes and we will provide towels. Yes! If each person understands fully the meaning of baptism, and each one has personally placed his/her trust in Christ for salvation, we encourage families to be baptized at the same time. It is a wonderful expression of commitment. However, it is important to remember that baptism is a personal statement of faith, not a family or group tradition. It is usually not wise to delay your baptism while waiting on others to join you. This puts an undue pressure on them and delays your obedience. A child may participate in Believer’s Baptism if they are at least 6 years old, have completed Kid Faith and have made a personal decision to receive Christ. We also have an opportunity for parents to dedicate their children at our Parent Child Dedication.